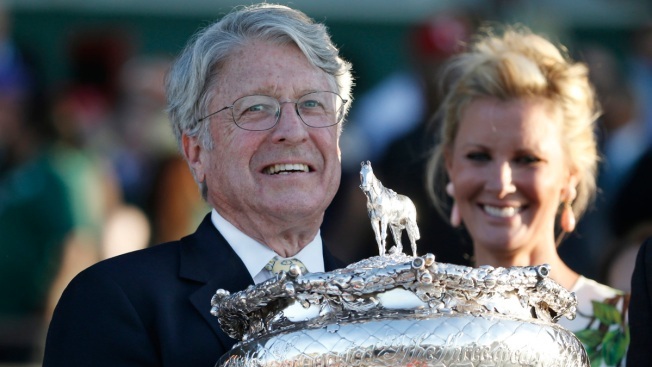 Tonalist owner Robert Evans poses for photos with the August Belmont Memorial Cup after winning the 146th running of the Belmont Stakes horse race on Saturday in Elmont, N.Y.
Robert Evans knows what it feels like to fall short of the Triple Crown. His family owned Pleasant Colony, the horse who won the Kentucky Derby and Preakness in 1981 before finishing third in the Belmont Stakes. When Pleasant Colony lost, silence fell over his family's box. On Saturday, it was Evans' turn to play spoiler. 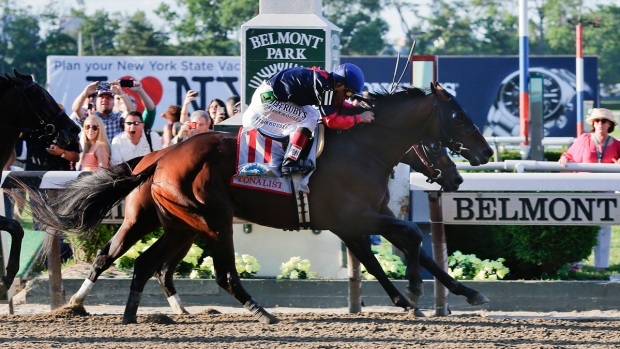 His horse, Tonalist, won at Belmont, ending California Chrome's bid for the first Triple Crown since 1978. 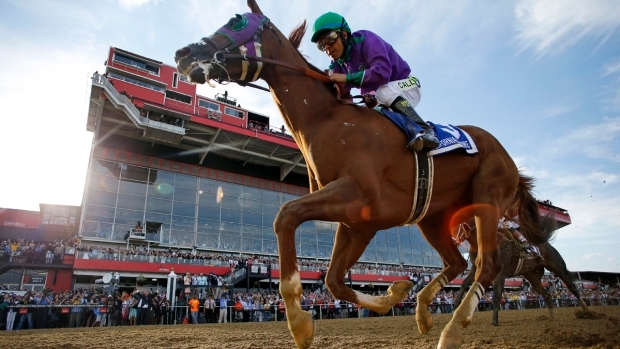 California Chrome finished far back in a tie for fourth. "I was slightly surprised," Evans said. He almost didn't even own Tonalist, but because of a tie to Pleasant Colony, who is the sire of Tonalist's dam, he decided to purchase the colt. A fellow owner dragged him to look at the horse, and wouldn't let up. "'You got to buy this horse,' she said," Evans recalled. "He didn't sell and the owner discounted him substantially." The victory was the first in the Belmont Stakes for jockey Joel Rosario. He finished third the past two years, riding Brilliant Speed in 2012 and Orb last year. "This horse, he did very good today," Rosario said. 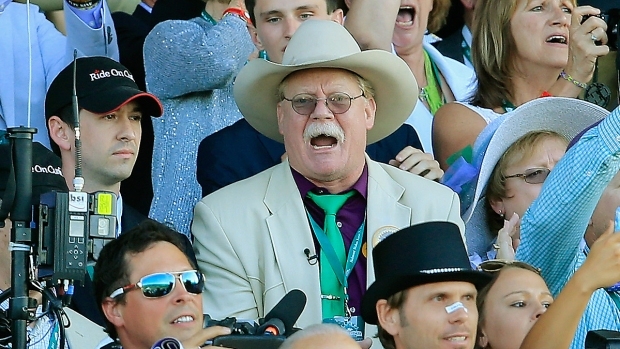 "I'm a little bit upset about California Chrome. If I was going to get beat, I wanted to get beat by him." While favorite California Chrome had never run at Belmont, Tonalist was very familiar with the course. He is stabled at Belmont and won the Peter Pan — the traditional tuneup for the Belmont Stakes — on May 10. "That proved he was a good horse, we had four weeks to get ready for this," Evans said. Tonalist kicked strongly in the final strides, edging Commissioner by a head to finish in 2:28:52. Medal Count was third, and California Chrome tied with Wicked Strong. "Tonalist is just kind of a big horse, and he has one long stride and just grinds it and keeps on going and going, keeps on coming, and he got the job done," Rosario said. Tonalist's trainer didn't like the idea that his horse had spoiled anything. "I don't like that because it claims it's something negative. There's nothing negative," trainer Christophe Clement said. "It created a wonderful buzz. There were 500 or 600 people to see him at 5:45 in the morning, which is great. It's what racing needs. There's nothing negative."